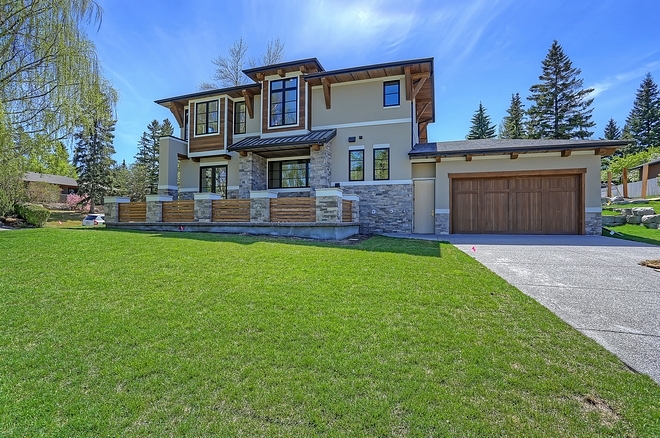 Built and designed by Veranda Estate Homes Inc., this custom home was designed to take advantage of the unique raised corner lot that it sits on. 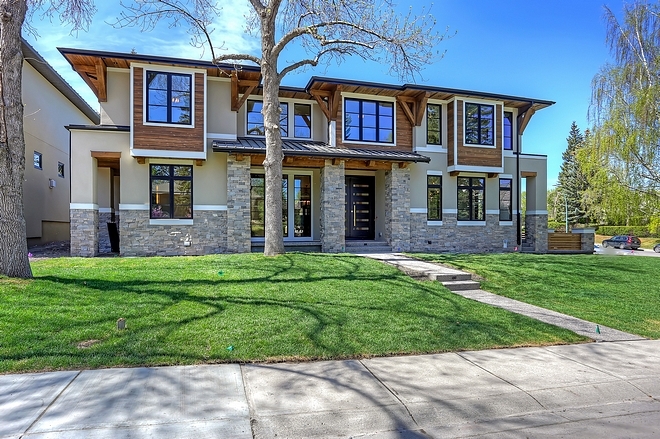 Every side of this home had large scale windows to take advantage of the raised elevation off the street which gives it total privacy and walls of green trees once summer decides to show its face in Calgary. 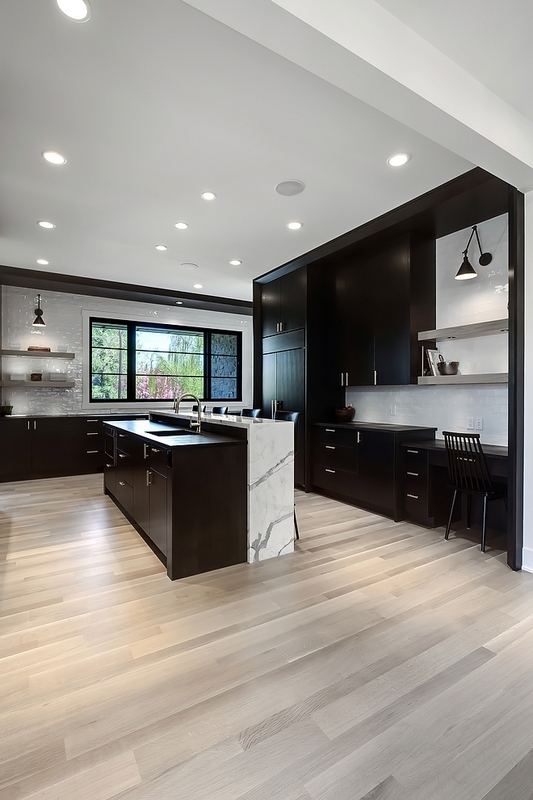 Since the home was a spec home, meaning the builder was building it without specific clients in mind, they were able to push the envelope with the overall plan and interior selections. 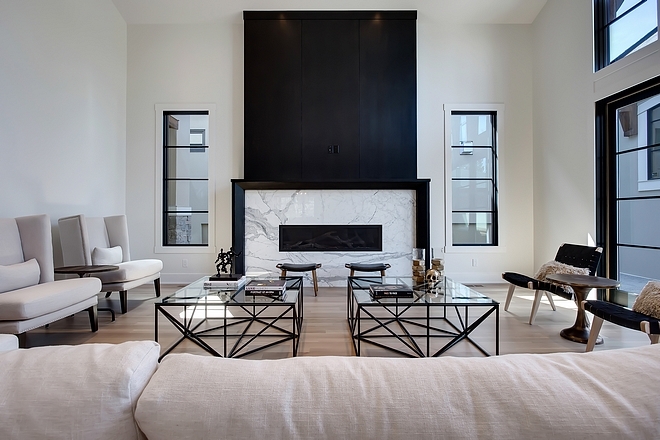 While each space is unique and individual, they kept the theme of black, white, and natural color wood elements consistent throughout the home. There are a lot of elements in this home that the designer, Melissa Manzardo Hryszko, gets asked about often. One is the staircase railing, which is a design she came up with for another home about 7 years ago. While it is certainly not cost effective, she felt it was a great investment for the space as it certainly demands attention. 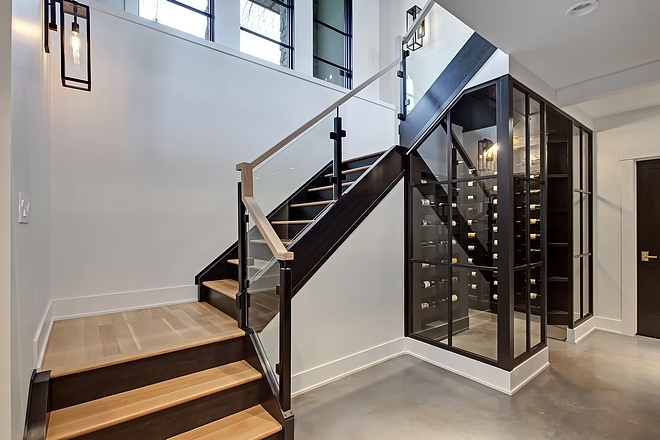 The staircase is a combination of custom iron post in a matte black finish, 10 mm glass panels, & a 1/4 sawn oak handrail. It goes perfectly with the black stringers and natural finish hardwood treads. The other feature people love are the dividers that she incorporated into the informal dining area. This space is viewed right when you walk into the home so she knew they had to somehow make this space special and define it in some way. 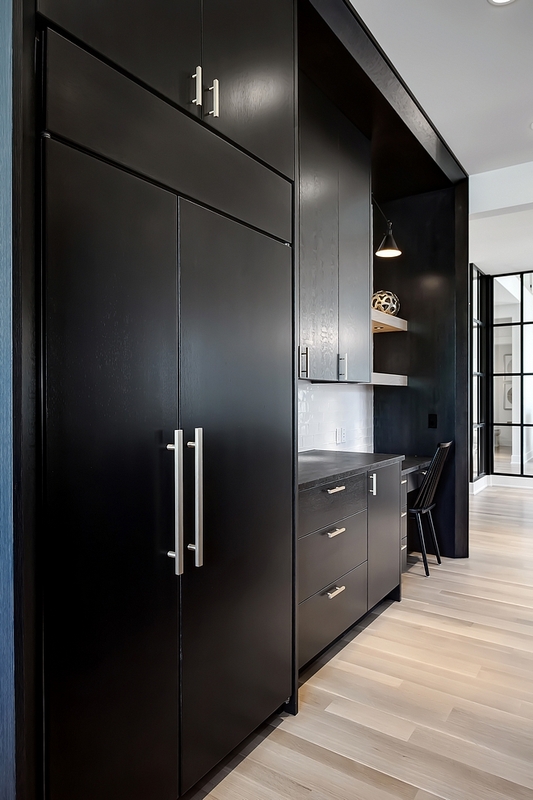 The industrial feel that these dividers add was the perfect touch to define the space. The counters are another thing people loved when viewing this home, you can’t help but touch them! They are a leathered Angola Black granite, simple and clean but the leathered finish takes these up a level! The smooth stucco color is Benjamin Moore Pashmina AF-100. Exterior trim paint color is Benjamin Moore Seapearl OC-19. 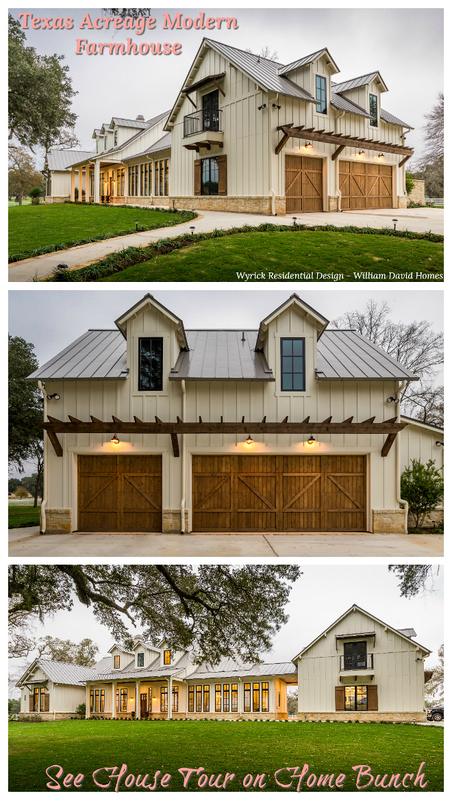 The house features a side entry oversized attached garage with 8’ tall cedar stained garage door. 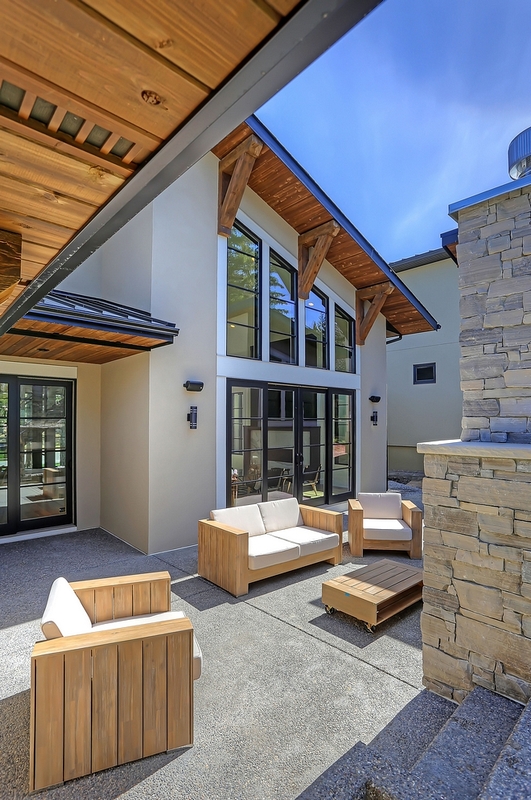 Home Style: West Coast Contemporary style exterior c/w low pitched roofs, 3’ overhangs, metal roof accents, cedar siding sections, and timber post detailing. House Size: 3,733 Sq. Ft. custom built 2-storey home. 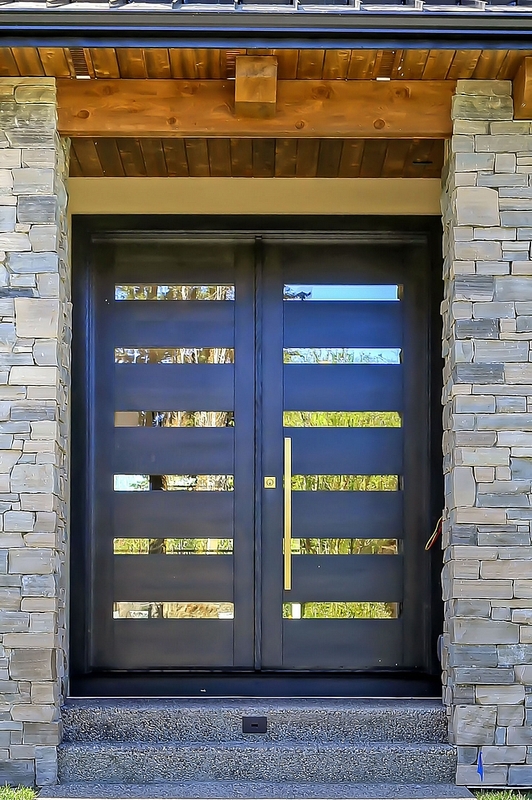 The custom-made 9’ tall front doors are White Oak – stained Back with glass inserts – Similar font doors: here, here & here. Hardwood flooring is finished on site 3” & 5” alternating boards in 1/4 & rift cut white oak finished with a custom stain and Bona Traffic in a matte finish applied. 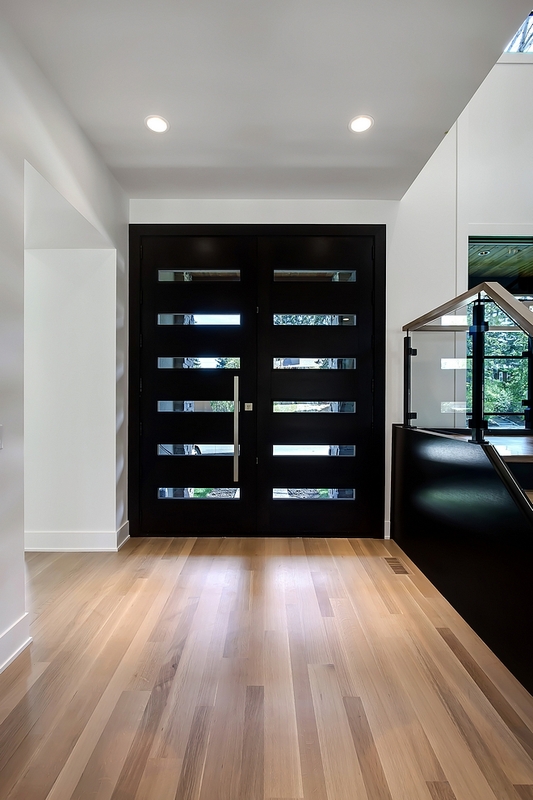 Door Hardware: 3’ tall custom pulls with deadbolt – Modern Entry Door Sets: here, here, here, here, here & here. Trim, Ceilings, Walls throughout is Benjamin Moore White Dove OC-17. The breakfast nook features glass & lacquered dividers. 8’ tall sliding Terrace doors leading to the patio from the nook. The lighting is Visual Comfort (Aged Iron – Extra Large). 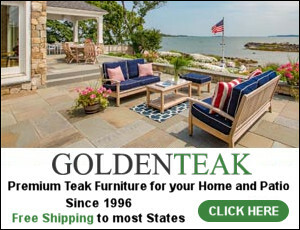 Table: Wayfair – Other Beautiful Dining Tables (Many Styles): here, here, here, here, here, here , here & here. 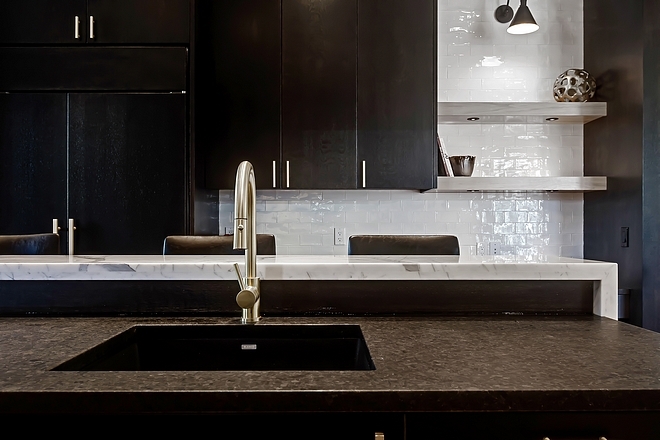 This kitchen feels dramatic, modern and unapologetic. 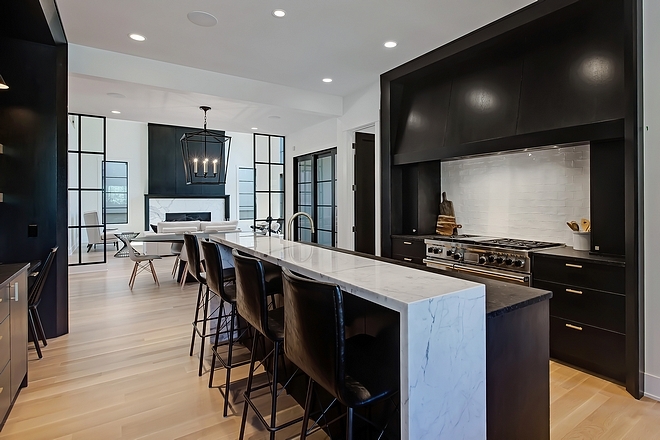 I love the layout and the raised kitchen island. 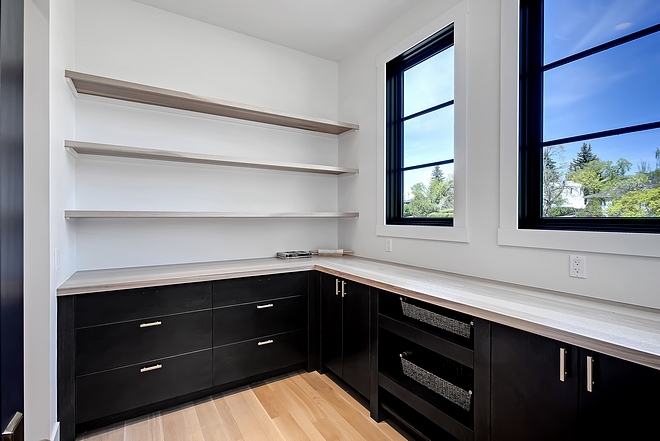 All of the cabinets throughout are custom and built-on-site in the home. The designer/builder went with a 1/4 Sawn White Oak for all of the back stained cabinetry. 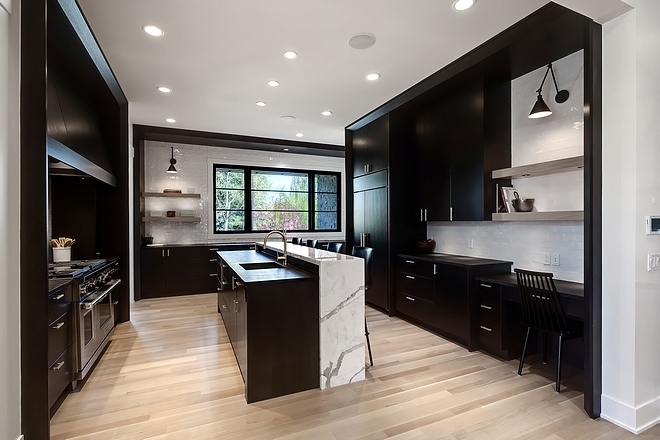 Raised marble counter in the kitchen is polished Statuario marble with mitered waterfall detailing. 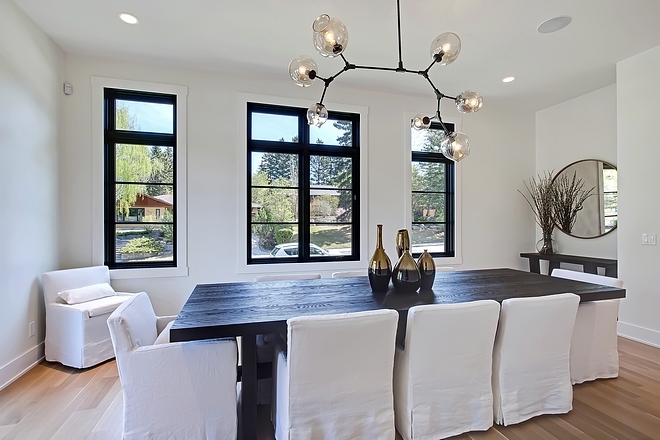 All black stained windows & cabinetry is a custom blended black stain and it was shaded to create the depth that you see in the images. Any painted cabinets are created with MDF and paint grade woods. Range: 48” Wolf gas range – Similar here, here & here. Beautiful Utensil Crocks: Here, Here, Here, Here, Here, Here & Here. 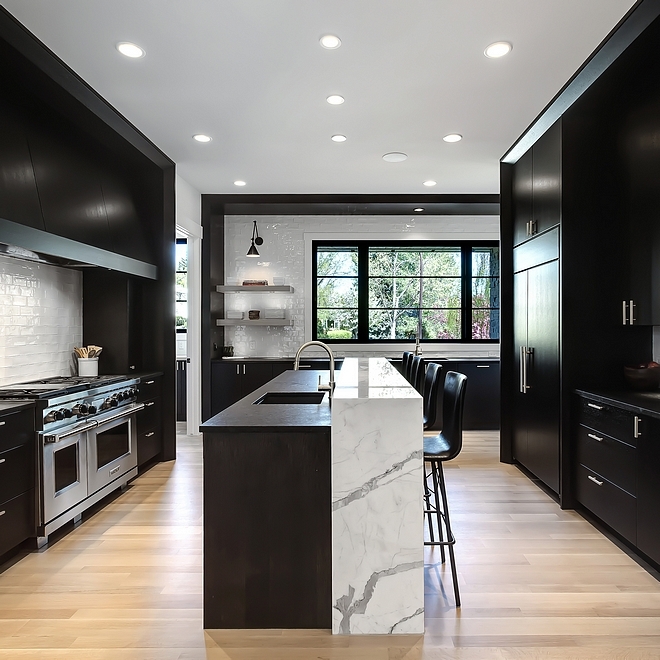 Kitchen Island Dimension: 9’ wide x 2’ deep + the marble raised section which adds another 18” of depth for this island. 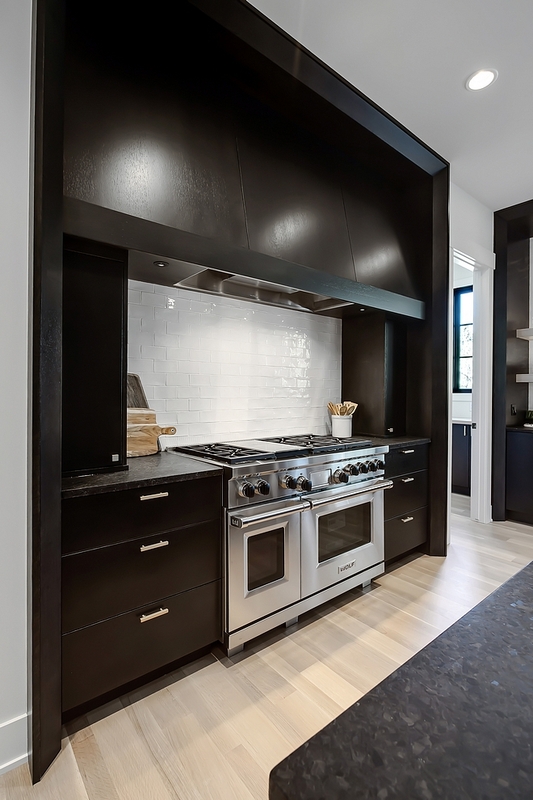 The island features built-in microwave drawer & Bosch dishwasher w/ paneled front. The kitchen also features a built-in command center wired for computer and phone. Lighting: Visual Comfort – Similar here & here. All cabinets and trim have a low sheen lacquer applied in 20 degrees. Refrigerator: Paneled 42” Sub Zero refrigerator – Similar here. 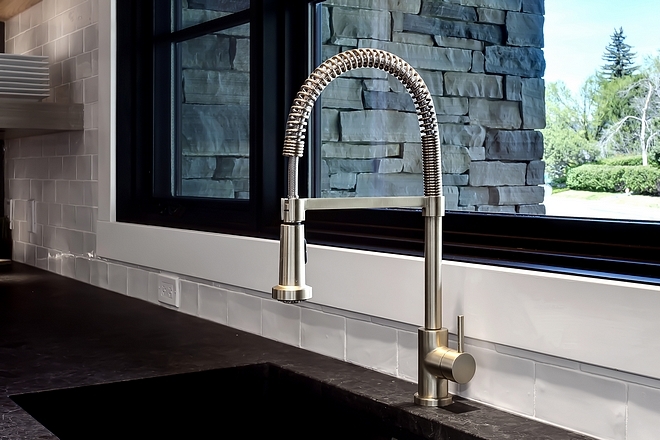 Island faucet is Delta in Champagne Bronze with Black Blanco kitchen sink. 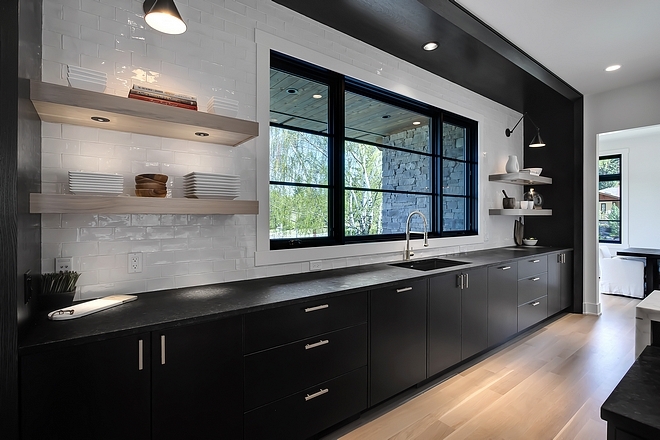 Backsplash is a Cotswold or Lancaster (goes by both names) 3×6 white tile – similar here. Kitchen counterstools are Dovetail Messina counter stool. Affordable Counterstool Ideas: here, here, here, here, here, here, here & here. 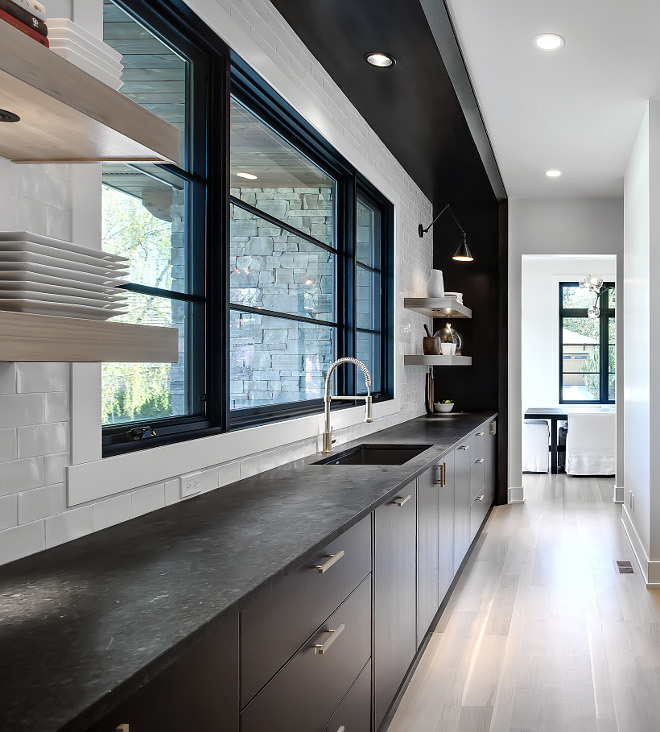 The kitchen sink wall features built-on-site 1⁄4 Sawn Oak kitchen cabinetry with extensive drawer detailing, pull out trash cans and cabinets to the ceiling. 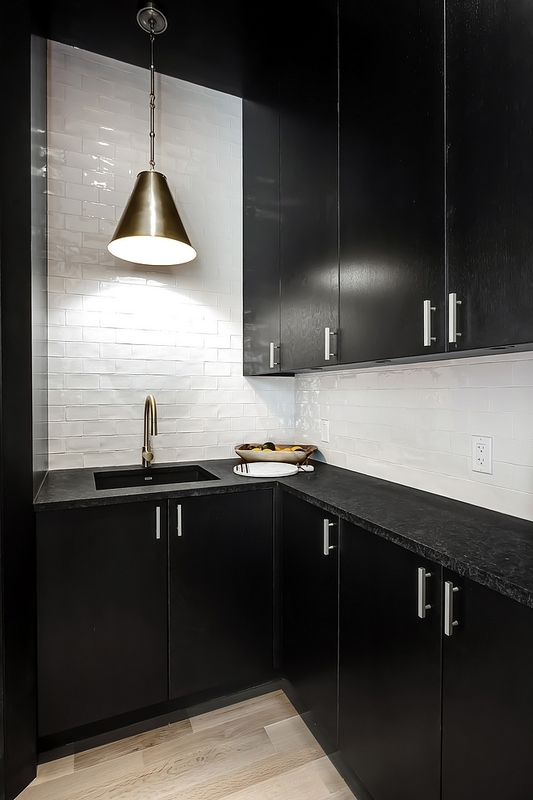 Countertop is Leathered Angola Black Granite. Kitchen Faucet: Aquabrass Wizard Kitchen Faucet – similar here, here & here. Kitchen cabinets are all custom pulls from Colonial Hardware – similar here, here, here & here. 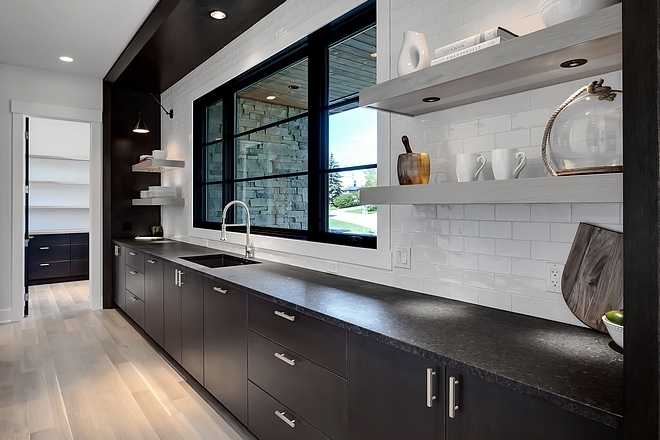 The kitchen has “miles” of countertop… isn’t it dreamy?! I’d love to cook in here! The kitchen floating shelves are Hickory – Similar here & here (White Oak). 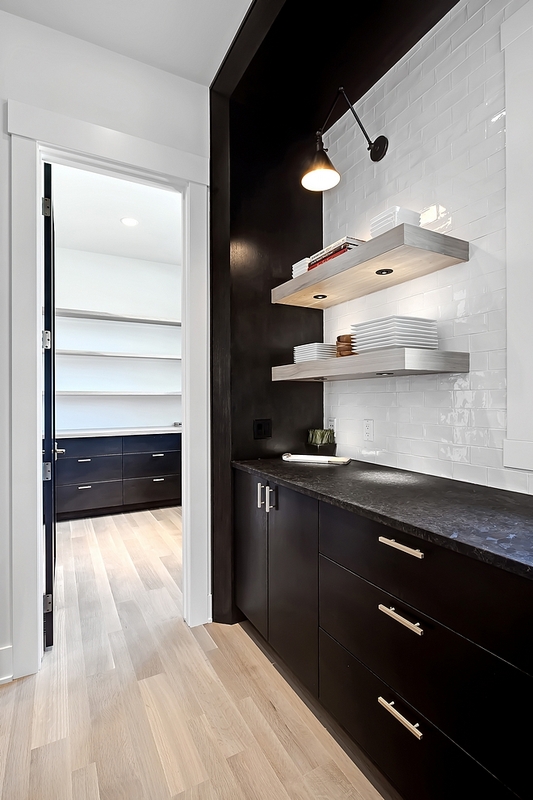 A door opens to an extensive pantry with lower cabinets, pull-out baskets and open floating shelves. Countertop and shelves are stained Hickory. This home features a large butler’s pantry with custom 1⁄4 sawn oak cabinets with under counter lighting. 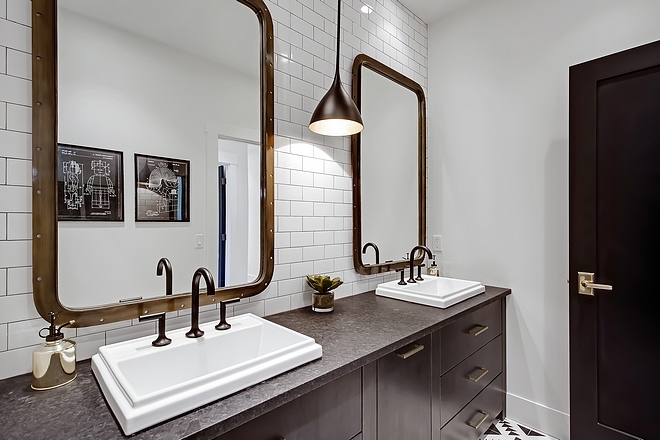 Faucet is Delta in Champagne Bronze with Black Blanco sink. The kitchen opens to a bright dining room painted in Benjamin Moore White Dove OC-17. 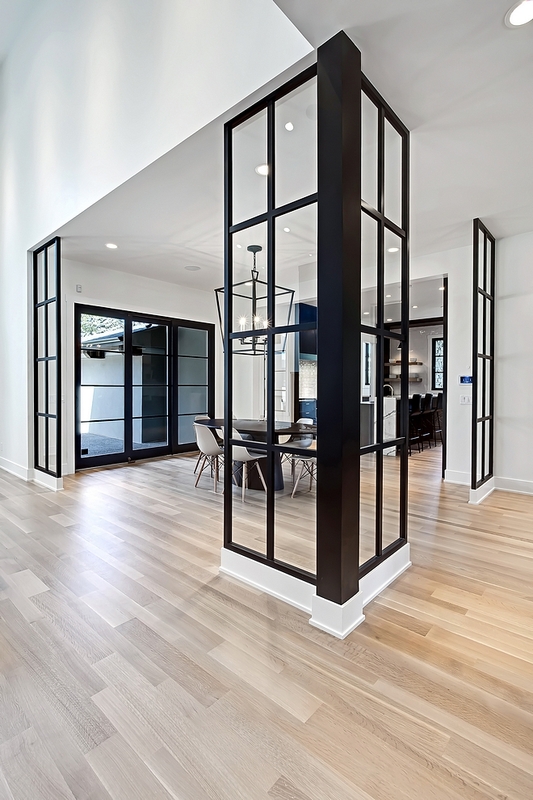 Double French terrace doors leads to a private courtyard. The modern hand blown glass chandelier can be found here -Similar: here (smaller version), here, here, here, here & here (sale!). Table, chairs and console table are Restoration Hardware. 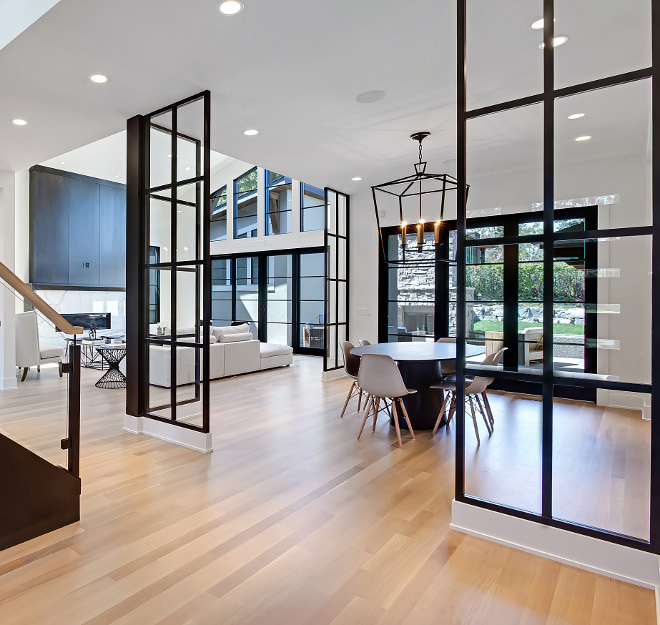 This bright Great Room features 8’ tall black sliding patio doors and high vaulted ceiling. Sofa is Article Cube Sofa – Beautiful Sectional Sofa: Here. 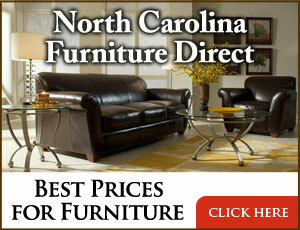 Coffee Tables are Dovetail – Find modern coffee tables here. Vaulted Ceiling Height: 18′ with 23’ vaulted. Metal side tables are Dovetail – similar here. White wingback chairs are Sunpan. 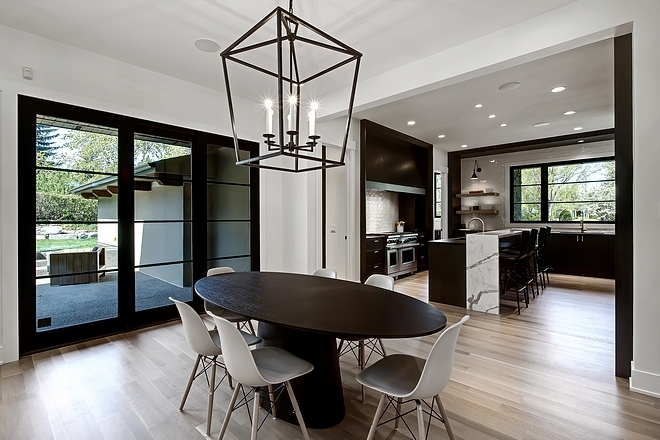 Black chairs are Stilnovo Sungar Arm Chair. Similar here, here & here (neutral). Stools are also by Stilnovo. Brass side table are RH Teen. Fireplace Details: Clear view single sided 70” gas fireplace with solid marble slab surround and driftwood log set in the interior. 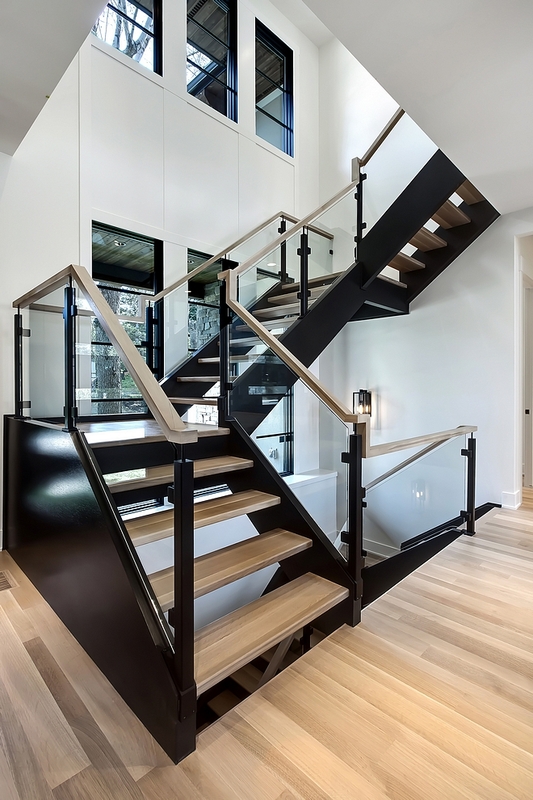 The staircase is a combination of custom iron post in a matte black finish, 10 mm glass panels, & a 1/4 sawn square Oak handrail. It goes perfectly with the black stringers and natural finish hardwood treads. 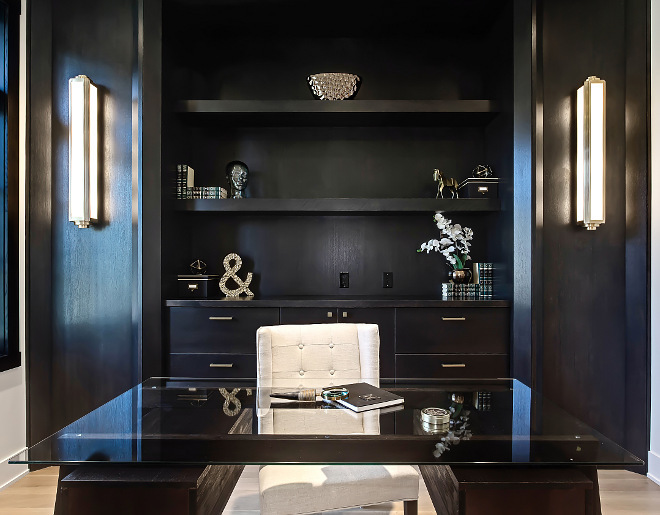 The home office carries the same custom 1⁄4 sawn oak cabinetry. Note the floor plug under desk. Handy! Corner chair is from HomeSense – Other Chairs (different colors & fabrics) here, here, here, here, here, here & here. 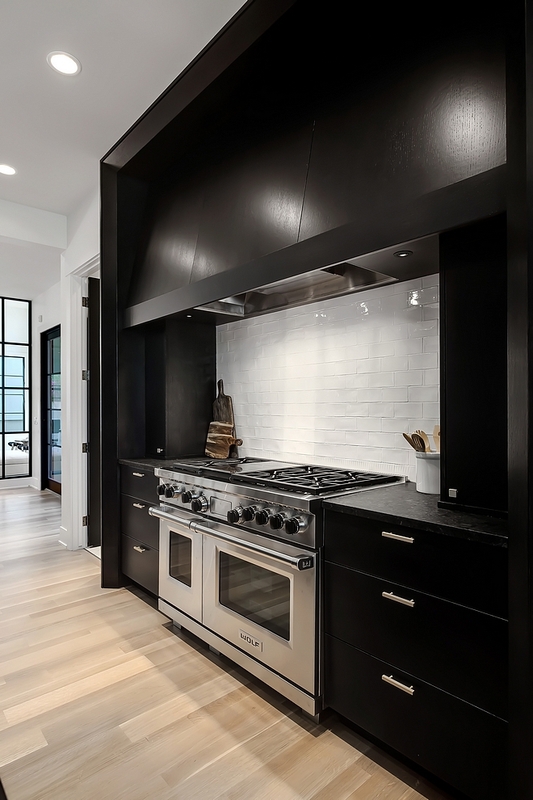 The dark cabinetry looks great with the black windows and the light hardwood flooring. Desk chair is also by Sunpan. 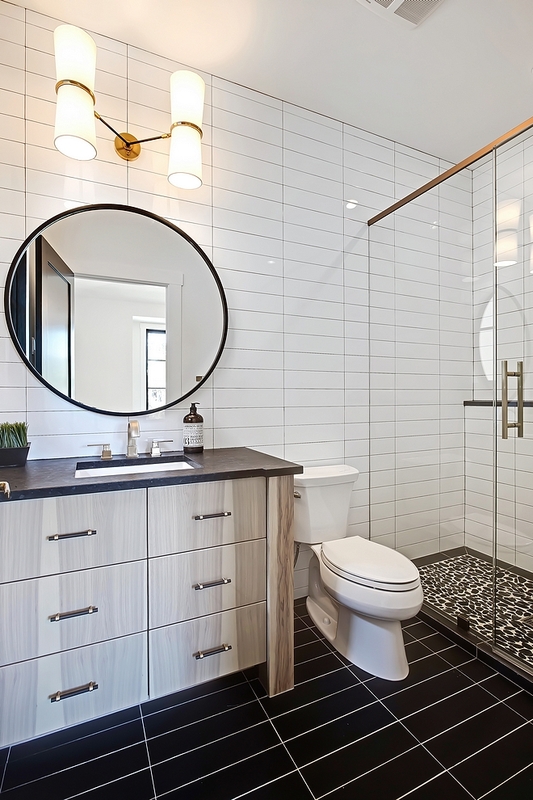 This modern farmhouse-style bathroom features 4×16 white subway tile in a horizontal stack pattern on walls and 4×16 black subway tile in a stack pattern on floors. 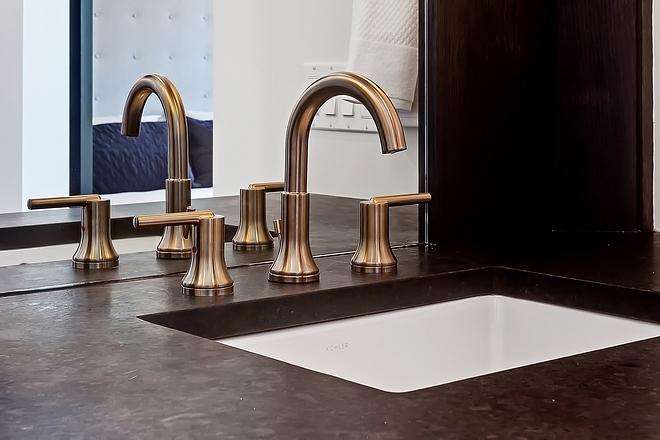 Faucet is Delta in Champagne Bronze. Cabinet is Hickory with a custom stain. Mirror: Custom round mirror – similar here. Shower Tile: 4×16 white subway tile in a horizontal stack pattern & river rock for shower base. Shower Faucet: Delta in Champagne Bronze. Bedroom paint color is White Dove by Benjamin Moore. Lighting: Matteo Lighting C57005RB – similar here (large). 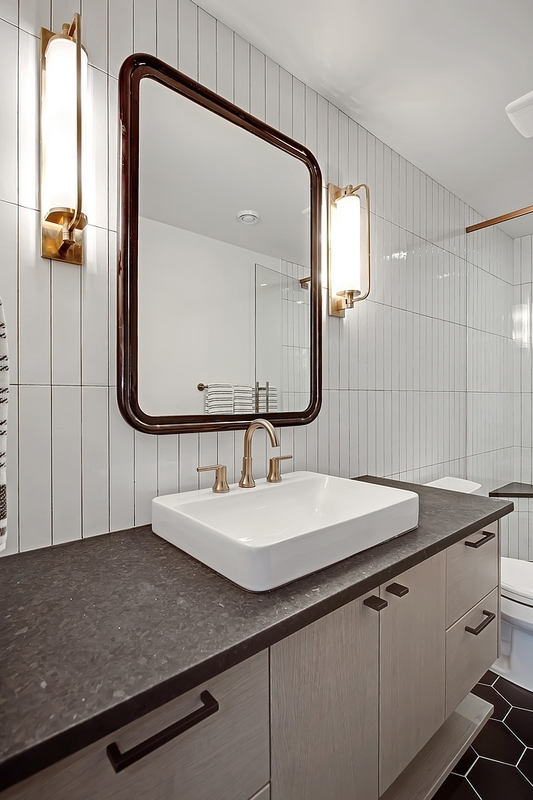 The main bathroom features heated 8” x 8” black and white cement tiles and custom vanity. Rounded Edge Rectangle Mirrors are RH Teen Pierced Metal Dresser Mirror – Others: here, here & here. 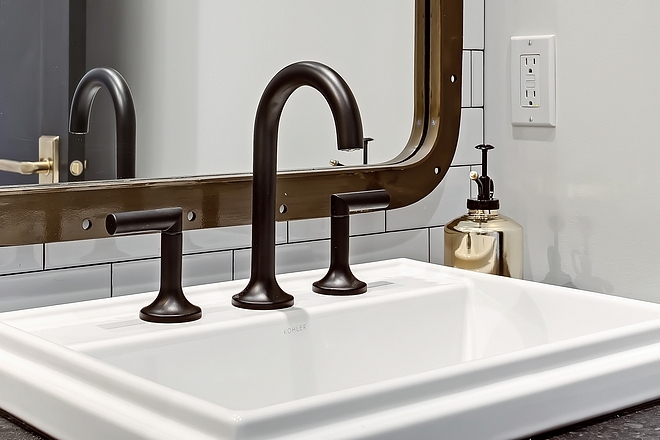 Faucets are Brizo Oden in Matte Black. 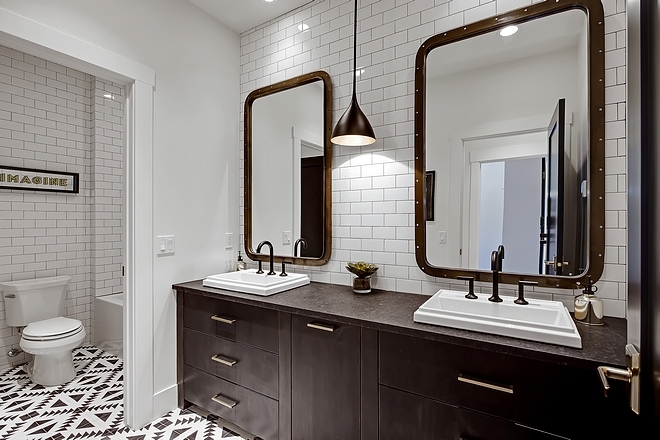 Black & White Cement Tile: Here – in Grey: here. 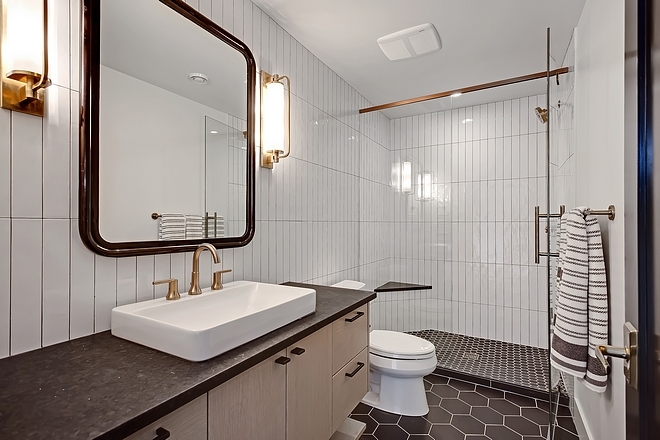 The basement bathroom features heated 8” matte hexagon black tiles and leathered Black Granite countertop. 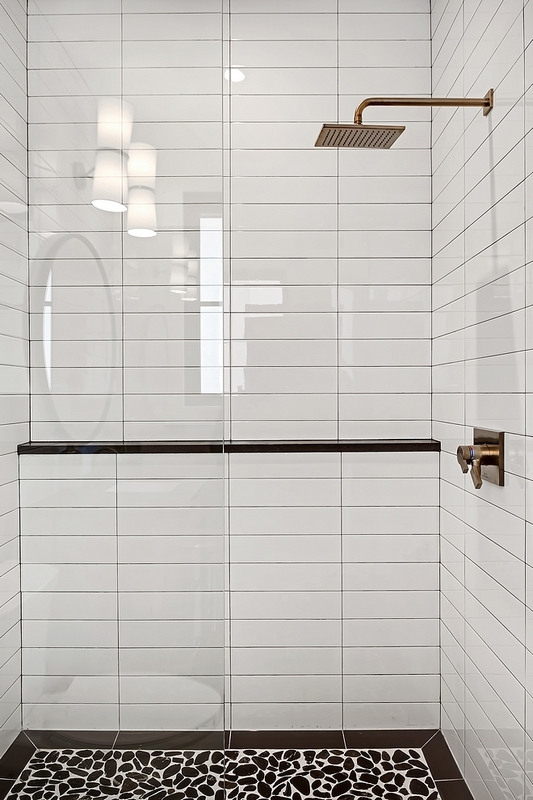 Wall tile is 3×12 vertical stacked subway tile on walls in white gloss. Vanity: 1/4 sawn white oak with a custom milky stain applied. 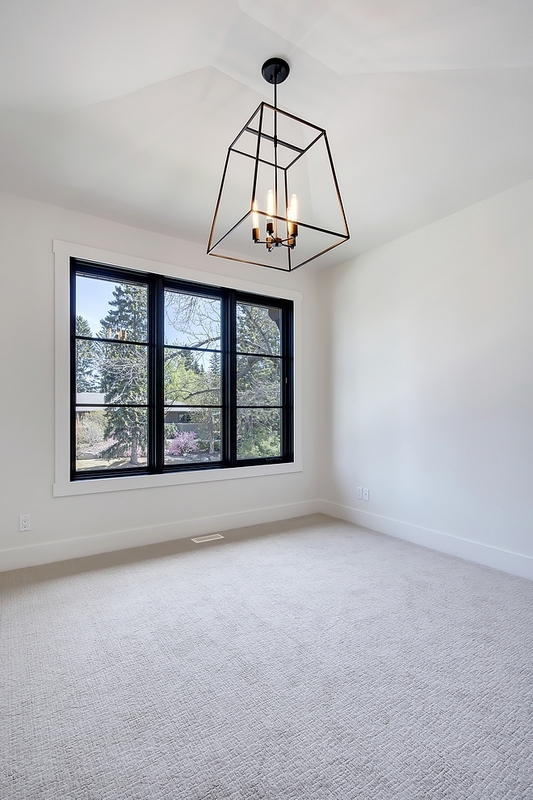 The master bedroom features a modern chandelier by Stilnovo – similar here. Bedside tables via RH Teen. 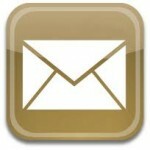 Bed & bedding via RH – similar here. Bench is from Sunpan. Other Colors: here. The barn door paint color is Benjamin Moore Midnight Dream 2129-10. 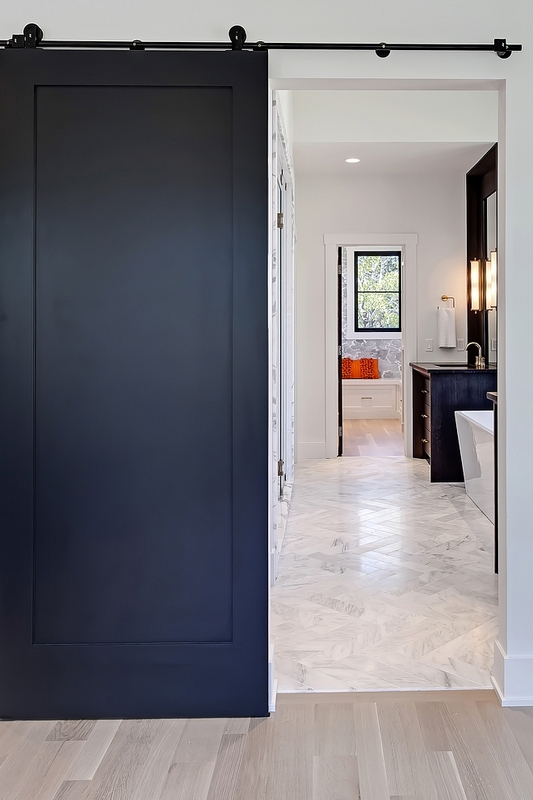 Bathroom Flooring: Master Bathroom flooring is heated 4×24 Carrara in a herringbone pattern. 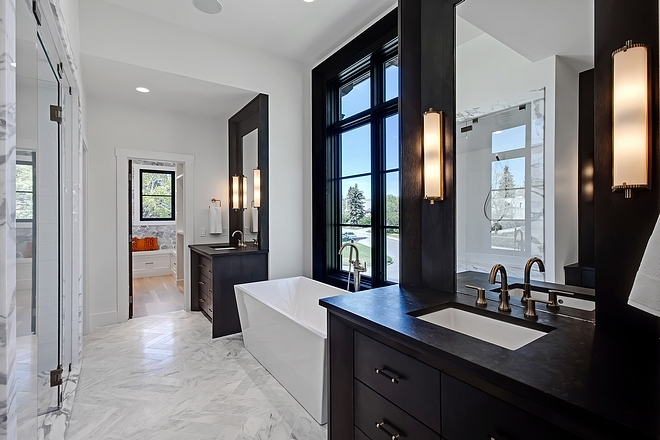 The master bathroom is spacious and it features a very inspiring layout. 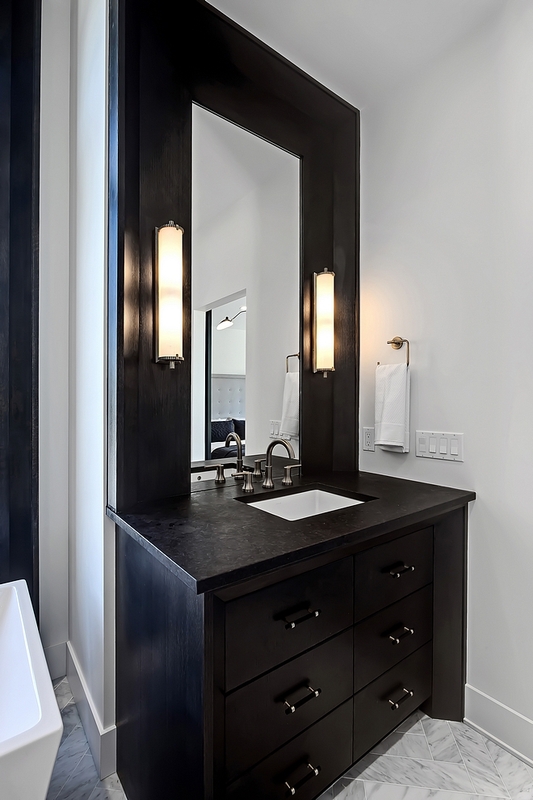 Bathroom also features ‘His’ & ‘Hers’ custom 1⁄4 sawn oak vanities with granite vanity tops. 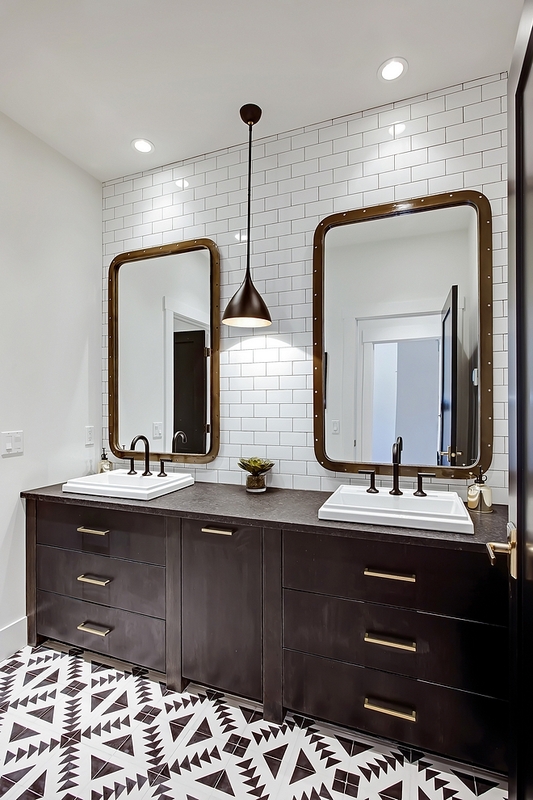 Master Bathroom is Delta in Champagne Bronze. Free standing soaker tub with floor mount Delta Trinsic tub filler in Champagne Bronze. 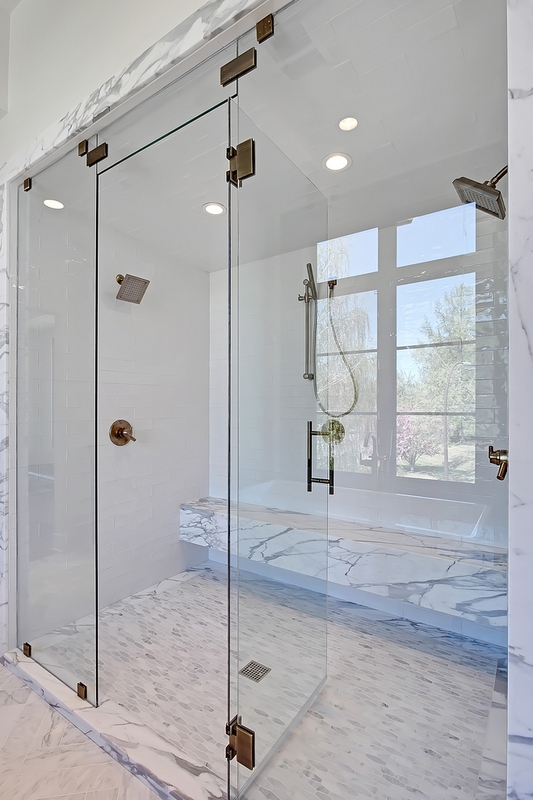 The master bathroom shower features 3×12 Cotswold white tile for walls and ceiling (steam unit), solid Statuario marble bench, Carrara long octagon mosaic for the shower base. Wallpaper in the master closet is from Cole & Sons – similar here – Other Beautiful Wallpaper Choices: here, here & here. This oversized walk-in closet has extensive shelving, shoe area, seating bench, full length framed mirror and over 15 built-in drawers. 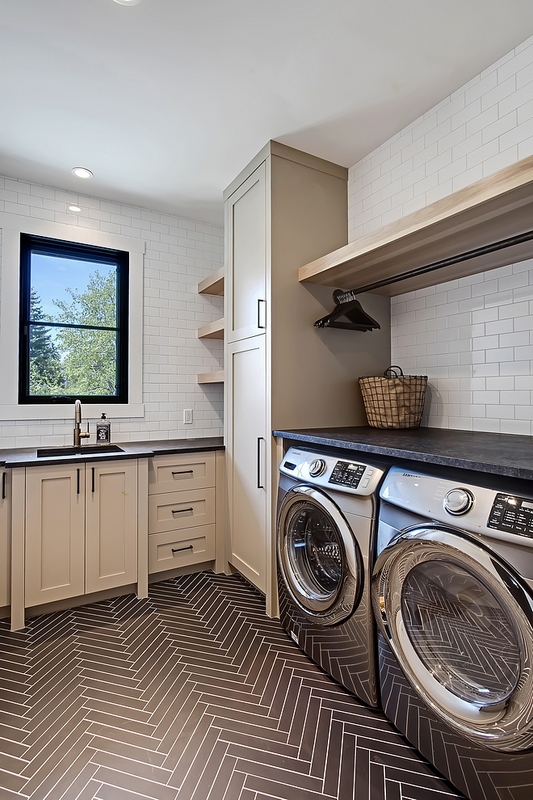 What a stunning laundry room! 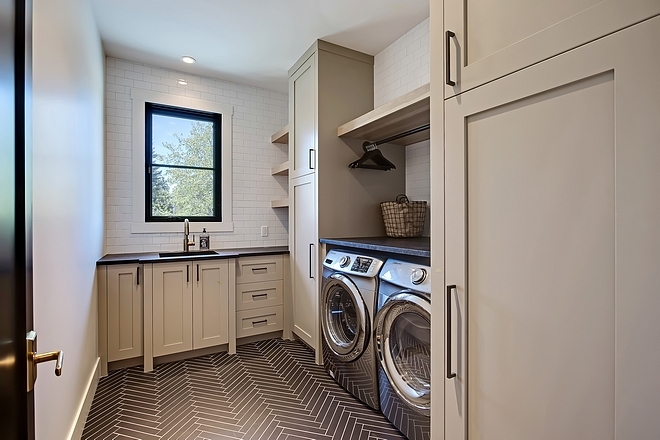 I am loving these warm tan cabinets and the herringbone flooring. Flooring is heated Olympia Regal series in various sizes. Cabinet paint color is Pratt and Lambert Ventana. Large laundry room with fixed hickory shelving & lacquered cabinets to the ceiling and hanging rod above the washer & dryer. Washer & Dryer: Samsung Washer & Dryer. Laundry Room and lower level mud room cabinets are also in Pratt & Lambert Ventana 11-25. 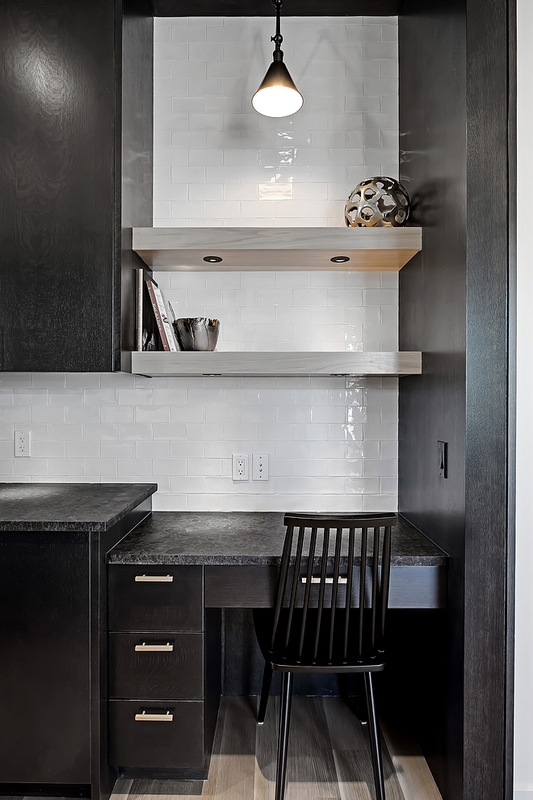 Cabinet features built-on-site lacquered lockers with Hickory bench top. Basement Size: 1474 Sq. Ft. 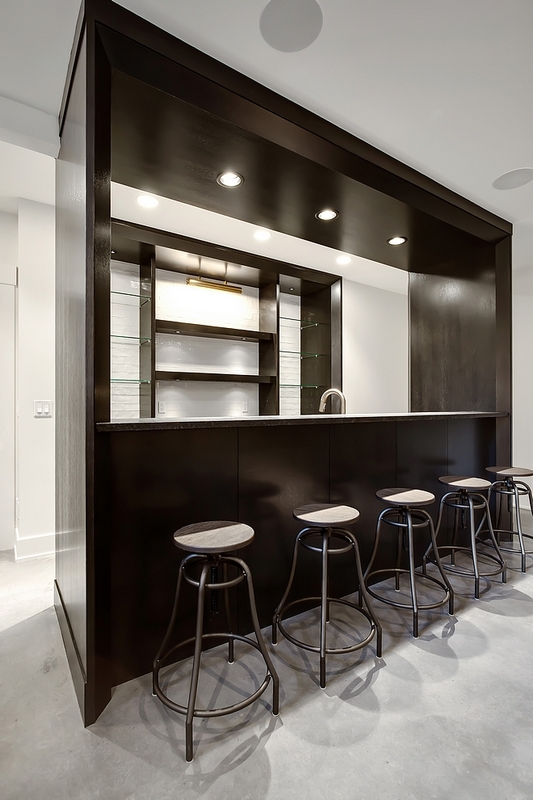 Basement Bar: Custom built-on-site 1⁄4 sawn oak wet bar with granite countertop. Barstools are Sunpan – similar here. Ceiling Height: 9’ lower level. 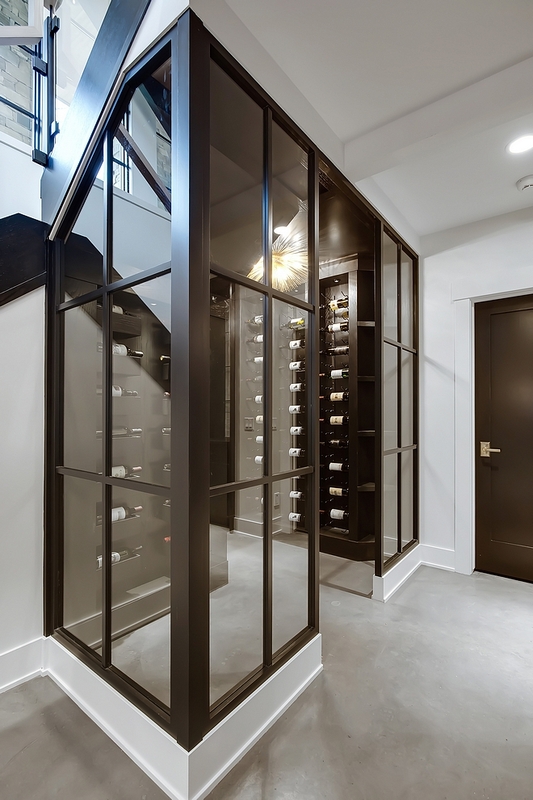 Wine Enclosure: Wood & glass walls with glass door leads to the wine room. Custom designed 1⁄4 sawn oak wine room c/w accent lighting. 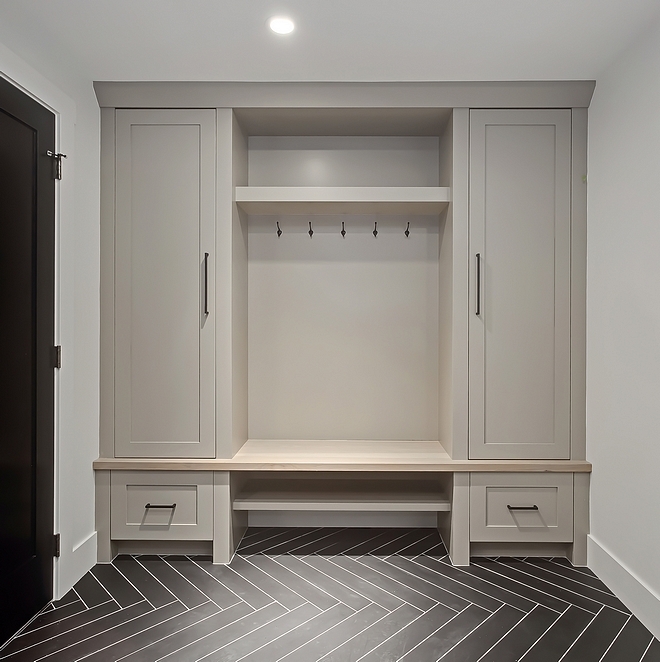 The main level mudroom features custom built-on-site 1⁄4 sawn oak lockers and shelves for shoe storage. Flooring is an oversized porcelain tile in a herringbone pattern. Outside is full of surprises as the interiors are! 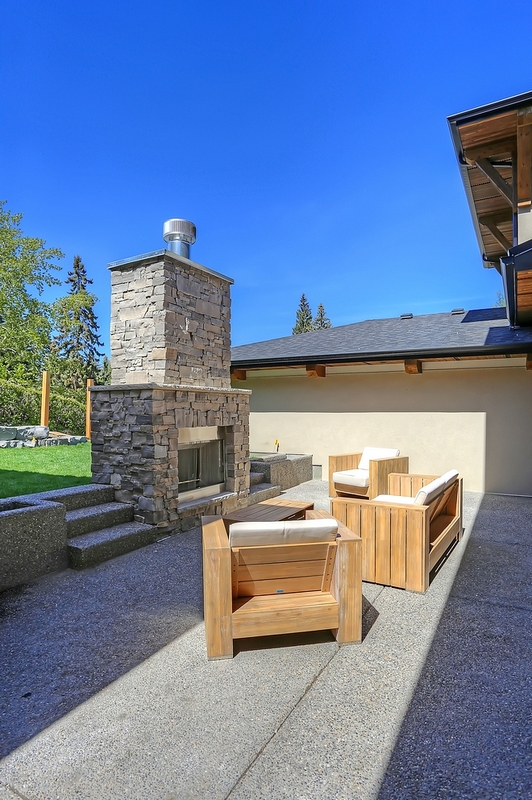 This large exposed aggregate patio features a wood burning fireplace with natural stone surround. Stone Sill: Buff Limestone with pitched edges. Soffits are stained cedar in Cloverdale Chocolate, one coat. Windows, fascia, downspouts are all Black. Windows: Oversized Aluminum Clad windows with Low ‘E’ throughout. Outdoor furniture is from HomeSense – similar here. 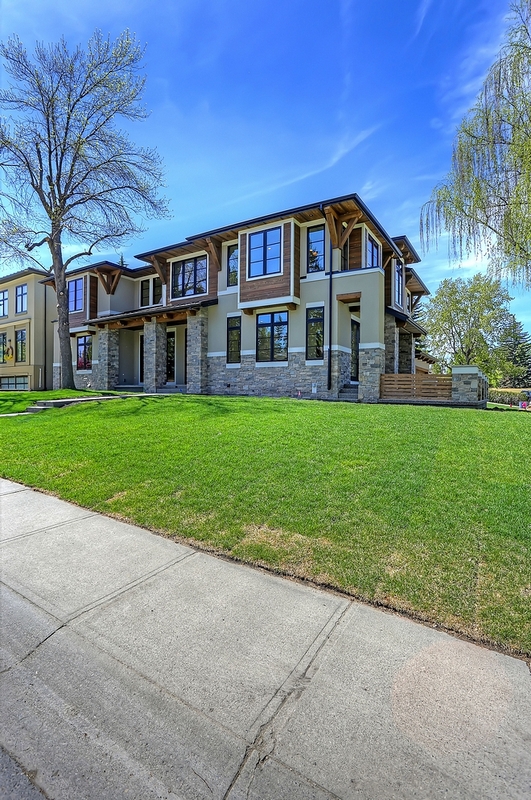 Builder: Veranda Estate Homes Inc. (Instagram & Facebook).